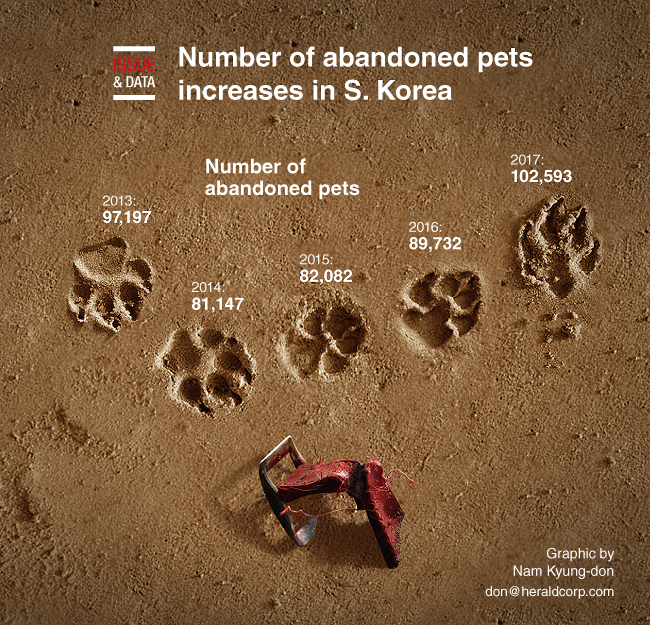 The number of abandoned animals continued to increase in South Korea, amid the growing number of households raising pets, government data shows. The number of abandoned animals stood at 102,593 in 2017, gradually rising from 81,147 in 2014. The number of households raising pets also increased from 4.57 million in 2015 to 5.39 million in 2017, according to statistics from the Ministry of Agriculture, Food and Rural Affairs. On average, 281 pets were abandoned every day in 2017. In the wake of allegations that an animal activist put down more than 230 rescued dogs, calls are growing for the government to revise laws to stop the vicious cycle of pets being massively produced in breeding farms, abandoned and put down.